Socrates, an Athenian soldier, was a calmly efficient killing machine. His student Plato was an accomplished and broad-shouldered wrestler. Martial arts and philosophy have always gone hand in hand, as well as fist in throat. Philosophical argument is closely parallel with hand-to-hand combat. And all of today’s Asian martial arts—like Karate, Kung-Fu, Judo, or Aikido—were developed to embody and apply philosophical ideas. The Japanese martial tradition of Budo, for instance, was influenced by the three philosophical traditions of Shinto, Confucianism, and Zen Buddhism, and these philosophies are still taught in Japanese martial arts schools all across the world. As Damon Young explains in his chapter, the Japanese martial arts customs of courtesy are derived from Shinto purity, Confucian virtues, and the loving brutality of Zen. In his interview with Bodidharma (included in the book), Graham Priest brings out aspects of Buddhist philosophy behind Shaolin Kung-Fu—how fighting monks are seeking Buddhahood, not brawls. 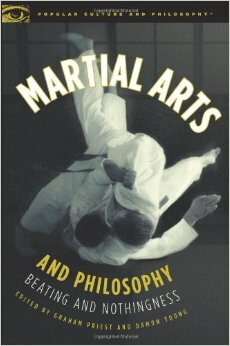 But as Scott Farrell’s chapter reveals, Eastern martial arts have no monopoly on philosophical traditions. Western chivalry is an education in and living revival of Aristotelian ethical theories. The Western martial art of fencing is explored by Nick Michaud, who looks at the morality of selfishness in fencing, and Christopher Lawrence and Jeremy Moss, who try to pin down what makes fencing unique: is it the sword, the techniques, the footwork, the aristocratic aura, or something else? Jack Fuller argues that his training in Karate was an education in Stoicism. Travis Taylor and Sasha Cooper reveal the utilitarian thinking behind Jigoro Kano’s Judo. Kevin Krein maintains that the martial arts are a reply to the existentialist’s anxiety about the meaninglessness of life. Patricia Peterson examines Karate’s contribution to feminism, and Scott Beattie analyzes the role of space in the martial arts school. Joe Lynch pits the Western ideas of Plato against the Eastern ideas of the Shaolin monks. Bronwyn Finnigan and Koji Tanaka uncover the meaning of human action as it appears in Kendo. Rick Schubert explains the meaning of mastery in the fighting arts. Moving to ethical issues, Tamara Kohn discovers what we owe to others in Aikido. Chris Mortensen questions whether his own Buddhist pacifism is compatible with being a martial artist. In different ways, Gillian Russell and John Haffner and Jason Vogel assess the ways in which martial arts can morally compromise us. How can the sweaty and the brutal be exquisitely beautiful? Judy Saltzman looks into the curious charm of fighting and forms, with help from Friedrich Nietzsche.